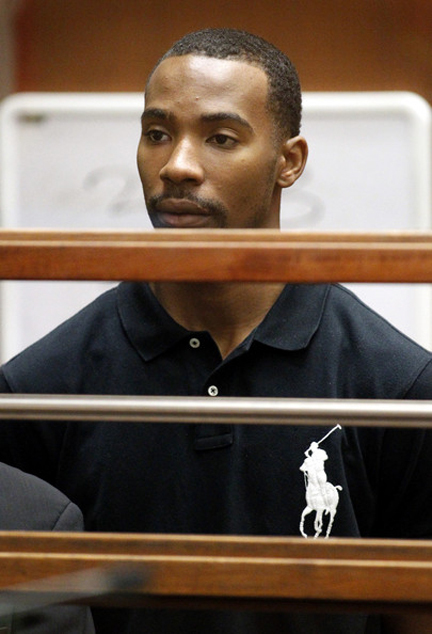 Javaris Crittenton, a former first-round NBA draft pick perhaps best known for his gun-in-the-locker-room confrontation with former Washington Wizards teammate Gilbert Arenas, was indicted Wednesday on drug charges in Atlanta, where he’s already awaiting trial for his alleged role in the shooting death of a mother of four. Crittenton and 13 other people were named in the indictment that was initially the result of an investigation conducted by the federal Drug Enforcement Agency, according to a source close to the investigation. According to that source, Crittenton conspired to deal cocaine and marijuana in the months before he was indicted last year for his alleged role in an August 2011 Atlanta shooting death. Shortly after 6 a.m. ET Wednesday, DEA agents, federal marshals and local police descended on Crittenton’s home on a cul de sac in Fayetteville, a suburb just south of Atlanta. Crittenton was led away in handcuffs and was booked into the Fulton County Jail. A call to Crittenton’s Atlanta-based attorney, Brian Steel, went unreturned. In April 2013, a Fulton County grand jury indicted Crittenton and his cousin, Douglas Gamble, for murder in the death of Julian Jones, 22, a mother of four children. That 12-count indictment also accused Crittenton and Gamble of participating in a criminal street gang and linked both to a second shooting in Atlanta that occurred five days before Jones’ death. According to court documents, both of the August 2011 shootings were in retaliation for a robbery committed against Crittenton and his cousin. On April 13, 2011, Crittenton and his cousin were held up at gunpoint by two men outside a southwest Atlanta barbershop and robbed of more than $55,000 worth of personal items and jewelry, according to a police report of the incident. According to the district attorney’s office, “Crittenton and the other suspects are accused of selling multi-kilo quantities of cocaine and several hundred pounds of marijuana” during a seven-month investigation dating to June 2012. He will have an initial court appearance Thursday morning on those charges; he had been on limited house arrest as he awaited trial for murder.